We started using a hand push lawnmower last summer. Definitely a good choice. It works, it's green and you get a workout while you mow. Until last summer we had a gardener who came and mowed our lawn and did other outdoor work. Life had calmed down a bit so we decided to take on this task ourselves and save some money. We didn't own a lawn mower so we had to decide what sort to buy. We don't have a huge lawn but it's big enough for the kids to run around and we spend lots of time sitting and playing outdoors in the summer. We also have a small lawn at the front of the house. We needed an option that wouldn't feel like a lot of hassle and ideally which would be safe to use while the kids are around. I was a bit nervous of using an electric lawn mower when the kids are around and it's hard to keep them indoors when one of their parents in ourdoors. But I assumed that a manual push lawn mower would be too much like hard work! I read some reviews and found that modern push mowers have improved a lot. So we decided to go ahead and choose a manual reel lawn mower. We've just got it out again for the first lawn mowing of the year and it's reminded me that it was definitely a good decision. It's very easy to get the mower out and while it's not hard work, you do get a bit of exercise while mowing the lawn. 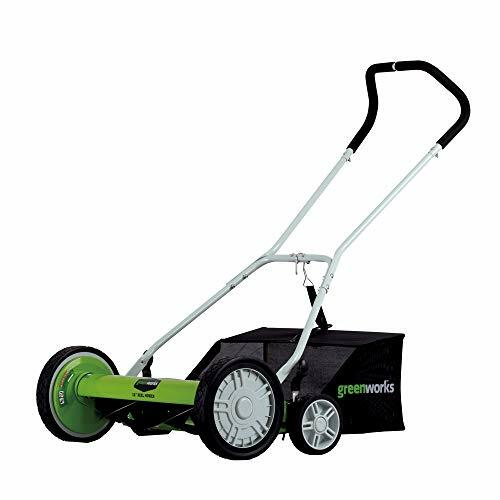 I've included an overview of some popular reel lawnmowers and a review of our push mower. Why Choose a Push Lawn Mower? 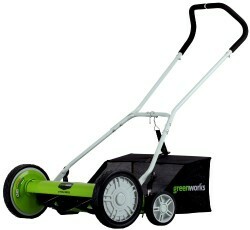 A hand push lawnmower is more environmentally friendly that a gas or electric model. It just uses human power! You can get some exercise while you mow the lawn! While these mowers aren't particularly difficult to use, they do offer more resistance than a gas or electric mower. A push mower has safety advantages over using gas or electric outdoors. We can mow our lawn while our kids are playing in another part of the garden and easily keep an eye on them. A push mower is much quieter than a noisy mower with a motor. Your neighbors will thank you! Push mowers are usually very compact and don't take much space to store. Push mowers are often cheaper that models that have a motor. And they are cheaper to fun because they don't need fuel. Push mowers are low maintenance with few moving parts. They should last for years. Push mowers are easy to use so you won't put off mowing the lawn because it feels like a major chore. A lot of people find that push mowers cut the grass more cleanly whereas gas and electric mowers tear the grass. We're certainly happy with how our push mower cuts the grass. Push reel lawnmovers come in a variety of widths from narrower 14 inch models through to wider 20 inch models. The smaller models are lighter, cheaper and easier to maneuver, but they take longer to cover the same area. If you have a large lawn then you'll find the wider blades are worth the trade-off of a larger turning circle each time you need to turn around. Should you get a Push Mower with a Grassbox? A lot of people are happy to use a push mower without a grassbox and just leave the grass clippings to mulch down on the lawn. This can work well if you cut the grass regularly and it's nice and easy as you don't even need to empty a grassbox or grass catcher. The clippings created by a push mower are fine and don't really cause a problem. I chose a model with a grass catcher as I have hayfever and thought it would be best to remove as much grass as possible from the lawn. I'm not sure it really makes much difference! 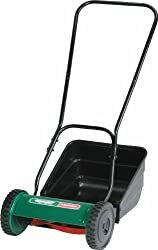 If you're in the UK like us, then I can recommend the Qualcast Panther Hand Powered Cylinder Lawnmower. It's the one we have and we're very pleased with it. It comes in 30cm and 38cm sizes - you'll cover your lawn more quickly with the larger one, but it's heavier and more expensive. This mower comes with a grassbox which catches most of the grass. We find that on a downward slope some of it escapes. So you might want to use a rake afterwards. It does collect most of the grass though. You do need to pick up any sticks from the lawn before you mow as they will stop the mower and you'll have to stop to remove them. My partner did replace the bolts on the handle with some better ones and they included ones were getting shaken loose with the vibration. Overall the mower has been an excellent buy. We much prefer it to an electric mower. Top pick outdoor speakers for a variety of budgets. In-ground speakers, rock speakers and high end luxury backyard speakers. Top pick outdoor wicker furniture sets for the patio or backyard. Live outdoors in the summer and enjoy the weather. Our top pick outdoor electric BBQ grills for hassle free summer cooking and entertaining. Large and tabletop models included. Have you tried a Hand Push Lawnmower?